The difference when you are linking internally, rather than to a web page as you might be used to, is you don’t have a URL in the traditional sense. Instead, you need to use the identifier (called a slug, more on this below) of an internal location, of which there can be two kinds: default locations and locations that you create yourself. Both of these are used to indicate an exact point in your document. NOTE: Internal links work differently on hosted Pressbooks networks than they do on Pressbooks.com. If you’re looking for instructions on creating internal links in Pressbooks.com, go here. The easiest way to find the location identifier of the section-title is to look at the URL of a page in the web version of your book, and copy everything that comes after .com or .pub (including the forward slash). Prefer to watch and learn? Watch this instructional video, created by our friends at BCcampus. 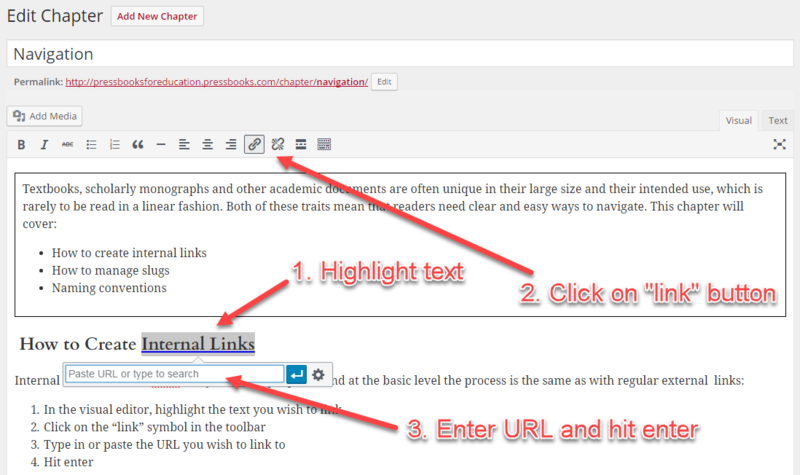 In order to create links between more than just chapters or parts, you can create custom location tags that you can then link to from anywhere in your book. Let’s say you’re writing a section of your book, and want to link to a list of terminology that you have written in an earlier chapter, named “Program Overview”. Enter a name when prompted (this must be unique). You now have an anchor tag the start of your heading, and should see it appear as a small icon. This indicates that the link is to go to a chapter named “Program Overview” and find the anchor tag called “terminology“. Link to figures from main body text and vice versa, eg. See Figure 1 (NOTE: to add an anchor tag to an image caption, you must add it manually in the image editing window, not the visual editor. Simply enter the caption as <a id=”[your-id]”></a>[Your Caption]). Link to specific sections of back matter. Link between chapter sections and their related exercises. Go into the chapter or section whose slug you want to edit. Find the “Screen Options” tab in the top right corner of your screen. Click on “Screen Options” again to collapse the tab. Scroll down to below the visual/text editor to find the “Slug” section. Save or update your chapter. If you have a long chapter name, shortening the slug can make it more manageable. If you start your title with a number (eg. “1. Program Overview”), your exports will add the word ‘chapter’ or ‘part’ to the front of the slug, which will break your links to that location. Use the slug editor to make sure your slugs start with a word, not a number. If you name both a part and a chapter the same thing, the exports will again add something to distinguish them from each other, breaking the links. Use the slug editor to make sure they’re different from each other. Even if you aren’t planning on using internal links to navigate, it is important to remember a few things about large documents that can be accessed in several different formats. For example, if we consider a textbook, one student could be reading the web version, another a copy they printed themselves, and another an ebook version with the font size increased because they have a visual impairment. In this situation, if all three readers are told to go to page 138, they will all arrive in very different places. With this in mind, a book that will exist in many formats needs to rely on other kinds of navigation systems. Note: When using this system, be sure to enable the two-level table of contents in “Appearance –> Theme Options”. This will show both chapter titles and sections on the table of contents in all formats.